Mediation and dialogue are now recognised as one of the most effective ways of preventing and resolving violent conflicts. They are the core of CMI’s expertise. Our new programme for the 2018 – 2021 period aims to consolidate our position as a leading independent organisation in the field of conflict resolution. Conflicts cannot be resolved through violence. A wide range of nonviolent means is available to fragile nations for supporting their transition from armed conflict to peaceful political processes. In this setting mediation and dialogue has been recognised as one of the most effective forms of preventing and resolving violent conflict. These areas form the core expertise of CMI, an independent conflict resolution organisation that helps conflicting parties settle their differences constructively. The work of independent conflict resolution organisations is needed now more than ever: the number of violent conflicts is on the rise, and these conflicts have become increasingly complex. Independent actors have a crucial role in supporting the conflict resolution efforts of official actors, such as governments and international organisations. Our independence gives us space to act where official actors cannot. We can flexibly move between the various formal and informal processes and actors, bridging gaps where they exist and adding to the overall effectiveness of peace efforts. Our new programme for the 2018 – 2021 period aims to consolidate our position as a leading independent organisation in the field, building on our track record and distinctive strengths. To better prevent and resolve violent conflicts, we place greater emphasis on strengthening women’s roles in peacemaking. A new focus area on policy and learning aims to ensure that the lessons learned from our work strengthen the international practice of peacemaking. We also want to make sure that the experience and expertise accumulated by Martti Ahtisaari over the course of his long career continue to be put to use for the good of the international community. The programme is focused on making meaningful contributions to peace processes in three regions –the Middle East and North Africa, Eurasia and Sub-Saharan Africa. In the field of international peacemaking, we have the great advantage of having strong Finnish roots. We engender trust because of our independence and because we do not have an agenda to push. We talk to all parties, but do not take sides. We encourage strong local ownership and peer learning from experiences with other peace processes. We are under no official constraints – we can act quickly, and engage confidentially without having to deal with the multiple struggles of day-to-day politics. As an independent organisation we are well placed to work at all levels of a society, and compared to many other NGO’s, we have the ability to work also in the upper reaches of political decision-making. Working between and within the official and unofficial levels, our programme builds genuine cooperation among decision makers, both those who are officially in power as well as those who influence outside the official structures. CMI’s particular strength is in being able to further peace processes by informal means and in a low-key way. The overall aim of our work is to help bring about far-reaching and lasting positive change in societies that have been devastated by conflicts. The processes that lead to a peaceful negotiated solution of a violent conflict require extensive cooperation and coordination among various actors. We work closely with conflict parties and with local and regional actors. We also cooperate with the broader international community. On one hand, cooperation can be illustrated in the efforts on synchronizing the CMI-led processes to the broader efforts of national, regional and international actors. On the other hand, we provide direct support to several organizations, including the European Union (EU), the African Union (AU), the Organisation for Security and Cooperation in Europe (OSCE), and the United Nations in the form of direct operational support. We also seek closer professional partnerships with the Finnish Ministry for Foreign Affairs and other Finnish actors to strengthen the knowledge, skills, and community of peacemaking, and to identify and provide distinctive Finnish added value in this field. CMI is committed to international mediation standards. Our work programme is aligned with the United Nations Guidance for Effective Mediation. CMI’s mediation and dialogue aims to build trust between conflicting parties by developing unofficial channels and spaces for dialogue. CMI produces mediation processes that aid the development of sustainable solutions to conflict. Mediation and dialogue are the most fundamental elements of our work. We address several challenges in the peace process: the lack of channels and lack of trust between the conflict parties, limited capacity and inclusion of the various stakeholders, and the lack of analytical frameworks for developing joint solutions. Here, the core of our work consists of activities in which CMI directly engages with parties to the conflict and other stakeholders as an impartial facilitator. CMI provides space for dialogue and negotiations to analyse the situation and work together with stakeholders towards mutually acceptable solutions for ending the conflict. In mediation and dialogue our niche and major added value is on informal, yet high-level interactions. Unofficial processes are at their best when they create safe spaces and communication channels where essential and difficult questions related to the conflict can be discussed, analysed and agreed on without being compromised by the high-stakes political manoeuvrings that often characterize official political struggles. And when this is coordinated with the official peacebuilding efforts, it provides a crucial building block in search for overall solutions. CMI provides expert support to help states, organisations and key individuals to mediate more effectively. By providing mediation support we help states, organisations and key individuals to be better equipped to undertake and support mediation endeavours. We deploy and share our pool of expertise and experience with other third-party mediators to support them in the long term in preventing and resolving conflicts in their target countries. There is increased recognition internationally of the need to strengthen the overall mediation capabilities of the different actors working in international mediation. Peace processes that are aimed at a mediated solution to a political conflict include a wide range of actors with different skills, resources and mandates. Providing effective support to the international mediation community can increase the chances of creating a durable peace. Mediation support includes long-term support addressing some of the systemic gaps in the international peace making system as well as on-demand operational support focusing on specific peace processes. CMI increasingly focuses on the latter, by supporting specific mediation teams in their mandated efforts. CMI assists states and other national actors in adapting the relevant principles and practices of effective mediation and conflict resolution to the specific political and societal processes of the country in question. In our experience, the crucial success elements of peace processes can many times be best guaranteed if the conflict prevention and resolution efforts are embedded in nationally-led entities within the existing political systems. Our underlying assumption in this context is that to prevent and resolve conflicts, external mediators or peace processes that are separate from the political and societal practices may not always be needed. CMI plays a constructive role in working directly with the key actors responsible for broader political processes, such as national dialogues, parliamentary work and societal, political and legislative reforms. We can bring together the best practices of mediation and dialogue – namely trust building, inclusion and analytical frameworks which emphasize political compromises over competition – and integrate them with national political practices. Women and their views continue to be systematically underrepresented in peace processes. With its expertise in inclusive mediation and dialogue, CMI works to transform the international commitments into real gains in conflict-affected countries. The inclusion of women and their interests in peacemaking is essential from the standpoint of equal rights, and for the quality of any peace process. Women play a key role in introducing a wider variety of viewpoints and narratives of the conflict to expand the scope of sustainable solutions. Without women, a substantial part of society may reject an agreement and refuse to participate in its implementation. Women’s inclusion can pave the way for democratisation and more just societies. 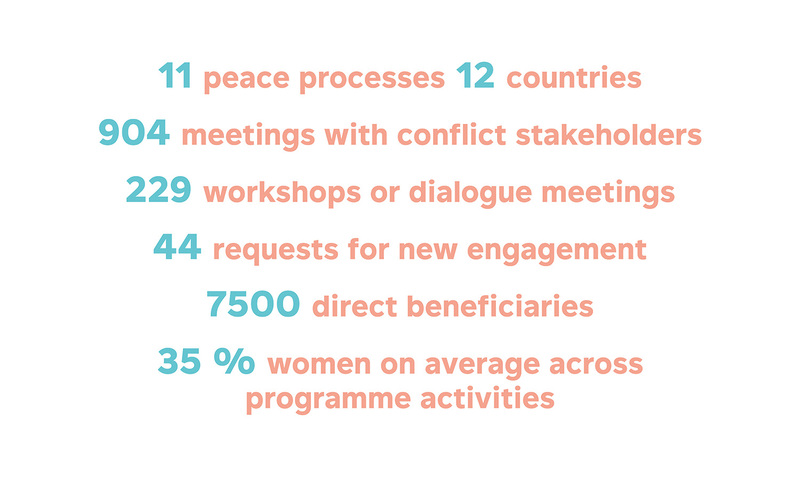 Increasing women’s meaningful participation in peacemaking has become one of the top priorities for the international community over the past two decades. Nonetheless, women and their views continue to be systemically underrepresented in peace processes. CMI’s value added in advancing women’s role in peacemaking stems from its integration into the core of our work, enabling us to take actions that feed directly into ongoing conflict resolution processes. Our emphasis comes from a nuanced understanding of women as political actors with diverse roles in peace and conflict, and a recognition of the importance of engaging men. There is a need for more established and commonly agreed practices and principles in peacemaking. Through its policy and learning focus, CMI contributes to developing the field of peace mediation to better meet the challenges of complex conflicts. CMI’s contribution to the development of peace mediation stems from our experiences in various contexts and themes; in the expertise and experience of President Ahtisaari as a leading global mediator; in CMI’s partnerships in the international peacemaking community; and in convening platforms and dialogue with peer organisations, governments, think tanks and international and regional organisations. A critical element of the policy and learning focus area is strengthening methodological innovation. The focus area is a platform for developing further the seeds of innovation that have been identified in practical problem-solving work in other focus areas.